In this interview with Heather Hansen, the author of "Wildfire", she talks about being embedded with a Boulder-based wildlands fire crew, and the problems and potential solutions of increasingly larger wildfires. Heather Hansen is an award-winning environmental reporter and author. Her book, Prophets and Moguls, Rangers and Rogues, Bison and Bears: 100 Years of the National Park Service, published by Mountaineers Books, won the Colorado Authors’ League General Nonfiction award and was a finalist for the Colorado Book Award. Heather’s most recent book, Wildfire: On the Front Lines with Station 8, was published by Mountaineers Books in March and is described by Outside magazine as a must-read for “anyone living in the ever-growing wildland-urban interface.” We sat down to chat with Heather as she prepares for a Western cities book tour. In the course of writing Wildfire, you spent nearly two years with the crew of Boulder’s elite Station 8 Wildland Fire Division. 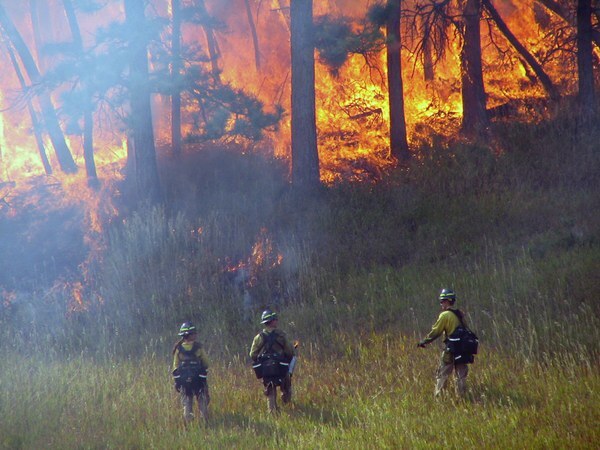 What inspired you to enroll in wildland firefighter training? I started spending time with the Boulder crew in the summer of 2015. During that time I also went out to western Colorado to do the training and testing to become a rookie wildland firefighter. I wanted to understand what it felt like, at least for a short time, to do the job. I also wondered what baseline knowledge firefighters had walking into their first fires. The experience did not disappoint. What was the training like? How close were you to the frontlines? I had a couple of days of classroom training, learning the basics of fire like the fire triangle, burning index, energy release component, as well as analyzing what went wrong on various fatality fires. We also had a wildland fire “simulation” during which our instructors set an actual fire in the shadow of Mt. Shavano and we trainees had to put it out. That was intense: hustling to the fire over steep pitches, swinging heavy tools while choking on smoke, trying to see if we were making any progress in tamping down the fire while our eyes stung and watered. I also took what’s called the work capacity test, or “pack test” which means walking (running is not allowed) three miles in 45 minutes wearing a 45-pound weight vest. It measures aerobic capacity, muscular strength and muscular endurance. I passed it, though barely, and took home souvenir blisters covering both feet. I’m not particularly wimpy, I’ve run a few marathons and hiked many of Colorado's 14ers but there’s something very different about the physical requirements of firefighting. For one, all the equipment is so heavy—your backpack, the hand tools, even the hardhat and boots and scratchy Nomex (protective shirt and pants). Plus the smoke, the adrenaline, the unpredictability, the hazards—all of that made it one of the most difficult physical feats I’ve ever done. 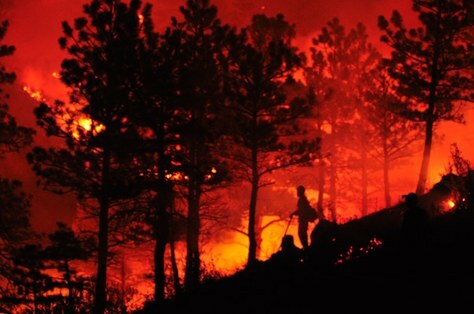 How did the time you spent in the field affect your perception of wildland firefighting? Imbedding myself with the crew allowed me to learn about their motivations, responsibilities, desires and fears—which I talk about a lot in the book. These men and women do things most of us can’t even imagine doing, but they shun the superhero image. One of the most remarkable things about them is the fact that they are only flesh and bone, yet they choose to walk alongside danger. You discuss the problem of the ever-increasing wildland-urban interface or WUI. What is it that residents and homeowners need to understand about the risks and responsibilities of living in the WUI? Over the past several decades, housing has expanded into areas where fire had once been a frequent visitor. During that time, private land in what’s now called the wildland-urban interface began to change —many more people were building on land adjacent to national forests and the like. Out West, houses and subdivisions are still springing up. Millions of people now live in close proximity to wildlands and that means we now have a lot of values at risk—homes, ecosystems, watersheds, recreation areas, air quality and, most importantly, lives. Structures in the interface increase the complexity of any wildland fire, and the danger for firefighters. There’s a lot that can be done for existing structures in the WUI. With the help of the world expert in structure protection, I talk in the book about how to protect existing homes. Ultimately it’s not a firefighter’s job to save a house from burning down. They’re not even supposed to be anywhere nearby it if the conditions are too dangerous. But what’s too dangerous? How do they decide? It’s never black and white. You mention in your book that since the year 2000, the West has entered the period of the “mega-fire” and that each year these fires get progressively more destructive. How do we manage our way out of this situation? For public land in general, we need to do a better job mimicking the natural process—recreating the historic patchwork of forests that had different types, sizes, ages, densities of trees. Diversity on the landscape tempers fire severity. Diversity in forests makes them, makes us all, stronger. And, in short, we do that with fuel treatments. On the national level, the U.S. Forest Service and collaborators need to increase the pace and scale of forest restoration. Unfortunately that’s not as easy as swinging a bigger chainsaw. Fuels treatment needs to be science-based; a plan for any area has to match an ecosystem’s requirements. We desperately need more of the right type of fire, so forest restoration also has to include planned burns and actively managed natural fires where, of course, it’s safe to do that. But prescription fires are not a well-supported practice in the West. People worry about air quality, and that things could go wrong. And that’s all true but, I can assure you of two things: first, prescribed burns are meticulously planned and second, the megafires we are seeing are much more unpredictable and air quality is far worse as a result of them. How does climate change play a role in what we are seeing with highly destructive mega-fires? Over the past few years, a strong link has been made between wildfire and climate change. One recent study concluded that human-caused warming specifically doubled the total area burned in the western US over the past 30 years. And that’s because fire conditions are changing in temperature, relative humidity, and wind speed. In general, temperatures are going up and moisture levels are going down. Snowpack melts earlier, spring comes prematurely, and dry time for forests is lengthened. This has extended and intensified the traditional fire season, which in the US is now roughly 78 days longer than it was in 1979. Ultimately, we are moving toward a year-round fire season in many places. Climate change isn’t just changing the length of the fire season but the quality of it. We are seeing more fires that are exhibiting extreme behavior—rapid fire spread, intense burning, prolific crowning, strong convection columns. Climatologists predict a future with the possibility of even larger fires. It’s a trend we should all be motivated to do our best to reverse.